So happy to have Katherine back in this space with her new project as the editor and photographer of the self published book, Cook in Israel, by Orly Ziv who is of a Greek, Jewish background. I have known a handful Greek Israelis growing up. The parents were from Saloniki (Thessaloniki) and the father was a World War II labor camp survivor. Back in 2011 Katherine was gracious to write a guest post and give us a tour of Mahane Yehuda Market, in Jerusalem, along with a Hummus recipe. Katherine lives now in the Southern part of Israel, where her husband is studying medicine, but often visits her home and stomping ground, NYC. Speaking of which, I was sad to miss her the last couple of times I was back in Israel, as she was visiting the States. I love Katherine's writings on her blog as well as the various publications she was published in. I almost squealed with joy when I saw she was sharing a green shakshuka recipe here, which I meant to post for years now. It was completely uncoordinated. Telepathic. It was faith. Hop below for a fascinating recipe and read. Thank you so much to Shulie for hosting me on Food Wanderings today! Shulie and I have developed a relationship through our blogs and, specifically, through our Israel connection. Having lived in Israel for the past three years I’ve fallen head over heels for the food. I’ve been exposed to Jewish and Arab cooking from around the world, and have developed a much more nuanced appreciation for these international cuisines. Israeli food is becoming quite popular these days, but there still only handful fabulous English-language Israeli cookbooks on the market. Which is one of the many reasons I was so excited to work on a cookbook with Orly Ziv. Orly is a dietician and nutritionist by training, and runs culinary tours and cooking classes through her company Cook in Israel. I first met Orly years ago while working on an article about culinary tours in Israel, and instantly fell in love with her cooking style and warm personality. 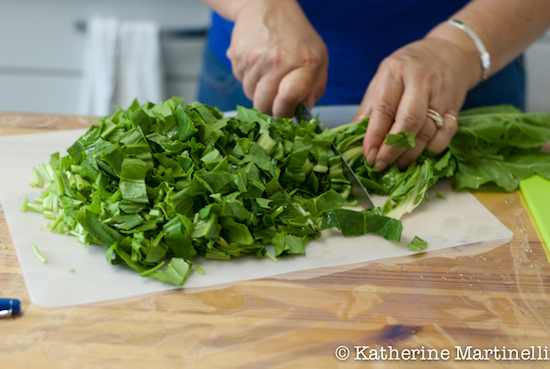 When she approached me about photographing and editing her cookbook, I was over the moon. The project - Cook in Israel: Home Cooking with Orly Ziv – has been a labor of love since we went the self-publishing route and so did everything ourselves. But our small team of three (myself, Orly, and the immensely talented designer Idit Yatzkan) dedicated countless hours to ensuring that every little thing met our exacting standards. I went to Orly’s home in Ramat HaSharon, just north of Tel Aviv, almost once a week to photograph the recipes. No food styling, nothing artificial, no fancy set-up: just a camera, tripod, natural light (with the occasional help from my Lowell Ego light on rainy days), and Orly’s delicious food. The recipes in the book are all ones that Orly makes at home for her family. It’s a personal collection of simple, healthy dishes that are easy to prepare. They draw on Orly’s Greek-Jewish heritage as well as all the cuisines that are pot of the melting pot (or tossed salad – pick your metaphor!) that is Israeli cuisine. The greatest perk of the job was of course being able to sample each and every dish in the book – and I can tell you honestly and without reservation that they’re all absolutely amazing. I’ve cooked many of the recipes myself as well, and lots are now in my regular rotation. Some of my favorites include fail-safe challah bread, a surprising herb and feta salad, a perfect shredded carrot and pecan salad that goes with everything – and this green shakshuka. Traditionally shakshuka is a dish of eggs poached in tomato sauce that hails from Libya and is popular throughout North Africa. It has become one of the adopted national dishes of Israel and can be found at every café in the country. 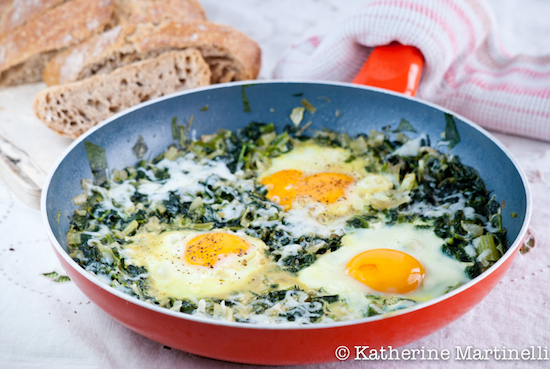 A popular but less common alternative is green shakshuka, where the eggs are cooked in spinach instead of tomatoes. It’s fresh, healthy, and immensely satisfying and makes for a great breakfast, lunch, or light supper. It’s naturally gluten free (although it’s best served with plenty of bread for dipping) and is easy to make. To check out another recipe from the book, see my recent Shavuot/Mother’s Day post with the recipe for Israeli-Style Cheesecake. 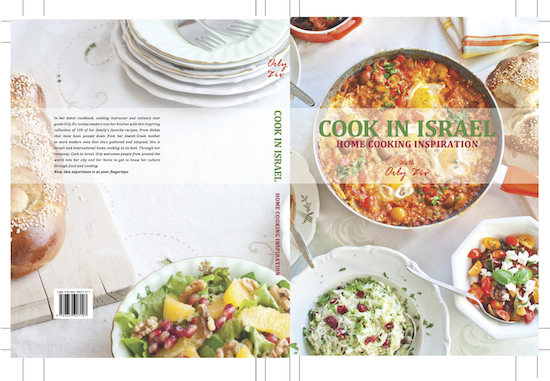 About the Book: Nutritionist, cooking instructor, and culinary tour guide Orly Ziv is pleased to announce the release of her first cookbook, Cook in Israel: Home Cooking Inspiration with Orly Ziv. Filled with 100 kosher, mostly vegetarian recipes accompanied by beautiful color photographs (including many step-by-step illustrations), the English-language cookbook shows that healthy and delicious home cooking doesn’t need to be time consuming or complicated. Books can be ordered through her website at www.cookinisrael.com/book and can be shipped worldwide. They will be available on Amazon and as an e-book in the near future. 1. Available for shipping worldwide to one lucky winner. 3. Follow @foodwanderings on Twitter and share on twitter: "I have entered @foodwanderings 'Cook in Israel' Cookbook GIVEAWAY http://tinyurl.com/nhrtdro Shipped Worldwide." 4. Like Food Wanderings page on Facebook and share the giveaway if you are not on twitter. 5. Leave up to 4 comments letting us know you followed and what fascinates you about the eclectic food of Israel. 6. The lucky winner will be picked by random.org at midnight Thursday, June 6th. Comments will be open until then. Both preview and giveaway copies are provided by the author. Heat olive oil in a large skillet and sauté the onion, garlic, spring onions, and Swiss chard stalks until the onions are golden brown. Add the spinach and Swiss chard leaves. Cook for a few minutes, stirring, until the leaves lose half of their volume. Stir in the wine and cream and season with salt, pepper, and a pinch of nutmeg. Bring to a boil and lower the heat. Cook for 20 minutes on low heat. Break an egg into a small dish and gently slide into the pan. Repeat with remaining eggs, evenly spacing them within the pan. Cover and cook until the egg whites are set but the yolks are still soft (or to your preference). Remove the lid, sprinkle with cheese, if using, and serve with plenty of fresh bread. A great giveaway! This cookbook sounds interesting. I love shakshuka and this version looks amazing! I already follow @MartinelliEats on Twitter! I already follow @foodwanderings on Twitter and have share the info. I have already liked Food Wanderings page on Facebook! I love Middle Eastern food and Israel's culinary diversity. I think you know how obsessed I am with Israeli food... so, while you had me at shakshuka, I'm kind of dying to get my hands on this book. Haven't had a lot of Israeli meal but I can say the book has a lot to offer. Self publishing is not easy and definitely needs a lot more commitment and motivation. I am keeping my fingers crossed and hope to win the giveaway as I can't wait to try more Israeli dishes. I liked Food Wanderings on Facebook and started following both Food Wanderings and Katherine Martinelli on Twitter. And I shared the giveaway in both places. Looking forward to following you! Followed you on Facebook and Twitter and followed Katherine on Twitter. Shared the giveaway in both places. Just tweeted! I'd love to discover Israeli cuisine! Love this blog. Shared the giveaway on facebook. Really nice blog. Tweeted the giveaway (my first tweet in forever. Also liked and shared on facebook. I love Israeli food, and have become something of an expert after living here for almost 6 years. What a yummy dish and gorgeous cookbook! Can't wait to try making this ASAP! the food is one of the things I miss most about living in israel. The shuk's smells, colors, sounds--perfect tehina, smooth hummus, shakshuka, grape leaves, halva, carrot juice! Israeli cooking has come so far and it is great to see it finally being recognized. Thirty years ago one was greeted with schnitzel and falafel and that was about it. Now everything has exploded with flavor and the food scene is so exciting. So happy to see this cookbook! Israeli food seems decadent to me yet it's so healthy! I love that! Love the flavors of Israeli food...need to try out more. LOVE Israeli food for it's farm to table freshness (before such a term was coined) and its bold flavors from so many cultures. Happy to follow you and Martinelli on twitter and liked you both on FB. ... and I tweeted about the giveaway! The thing I love about Israeli food is its versatility - and how much I like it. I went to Israel in 2010 and was kind of dreading the food because I was picturing feta cheese, gyros, and more Greek food in general - but it was soooo not the case. I had some of the best food I've ever had there! The bread, the cheese (even feta), the yogurt, the dessert, the lamb ... oh my word. I'm an addict. Saladgoddess following FoodWanderings on Twitter. I love shakshuka, and as a vegetarian, I gravitate toward Mediterranean/Middle Eastern foods like this with their emphasis on fresh vegetables. I like you on Facebook - and will share in our cookbook group! I collect cookbooks and would love this one...PLEASE! I have been following this blog for some time. Love it! The green shakshuka is on my radar for tomorrow. I love Israeli food, I'd love to have exposure to more of the culture and dishes. I hope I get a chance to see this book! It's is wonderful to see Katherine here today shulie, I love her blog and all her recipes. Katherine your puff pastry brunch ebook (that I won last year) is a great resource when I feel uninspired. When shulie announced the Israeli cookbook in google+ I was getting the feeling that I needed to own it. 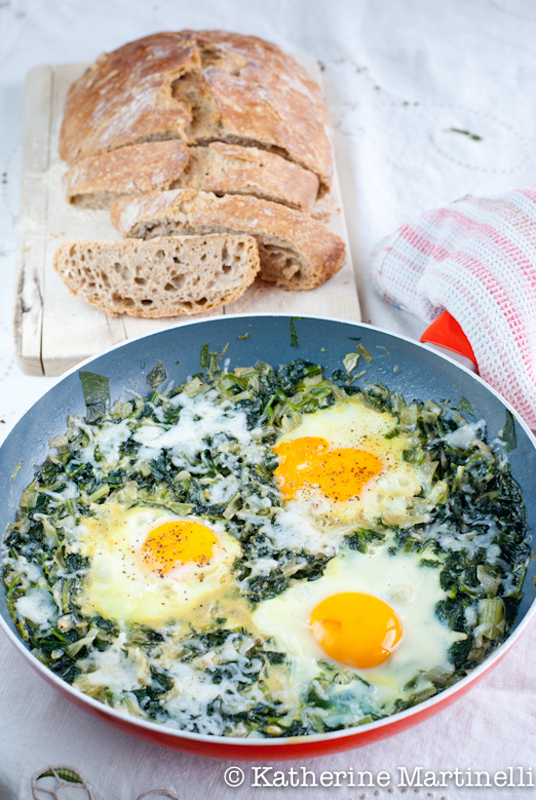 What a great idea to make a green shakshuka. I personally had toyed with the idea but I was reluctant too, since I have been enjoying the regular shakshuka so much. Israeli food is common here and we are all addicted to it in Goa. Especially Falafel is famous. Yet I feel I don't have a complete knowledge about Israeli food, so I am for sure eager to learn more! I follow Katherine on Twitter (@Culinary_Cam). OH my dear, I loved this post. What a beautiful book! And what a wonderful recipe. I love all the greens...we need more of them in our daily lives. I've traveled to Jordan, and I hope to go to Israel in the near future. The food draws me back. Thank you for sharing!! what a fabulous giveaway! I follow @foodwanderings on twitter and I now follow @MartinelliEats! I am jewish and always love to learn more about my own heritage as I was born and grew up in the states. Already following Katherine and Shulie from WAY back on Twitter. I should probably be leaving a comment each for those, right? Also following blog posts by email. So count me in for four comments. :) I recently spent two weeks in Israel and, if you can believe it, did not buy a cookbook. I'd love to win this one to extend the lovely memories of my time there, with creations in kitchen. The photos are gorgeous and I would love to try the recipes. I know very little about food in Israel, but this is the creamed chard we ate for decades in this country. At one point it was such a restaurant staple. Love it with eggs! And tweeted about the giveaway! Because I LOVE Israeli food - especially shakshuka! I've never made a green version before, but can't wait to try it! What a delightful recipe and post. It would be amazing to actually learn from Orly herself, when I visit Israel. I am just going to buy the book for now.